The Ministry of Culture, Sports and Tourism said Thursday that it would ask the prosecution to investigate seven government officials over their alleged involvement in the blacklisting of cultural figures by the two previous administrations. Of the seven, five belong to the Culture Ministry and accusations had been filed against one of them by a concerned cultural group. 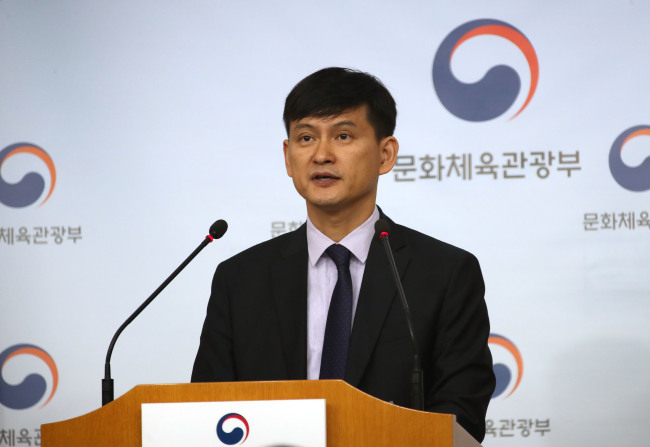 Three officials are currently heads of Korean cultural centers overseas, and will be summoned back to Korea as soon as possible with the cooperation of the Ministry of Foreign Affairs. Former heads of the Korean Film Council and Arts Council Korea have also been referred to the prosecution for investigation. The announcement came after the ministry’s investigative committee on the blacklist scandal recommended an investigation of 24 government officials and the suspension of 44. Of the 44, 22 had already received punitive action, and 12 of the remaining 22 had received an official warning. No actions were taken against 22 lower-ranking officials, as they were deemed to have had no choice but to follow their superiors’ orders. As of now, 48 Culture Ministry officials have received or are slated to receive some form of punishment for their involvement in the creation of the blacklist. The blacklist scandal, which first came to light as corruption charges against former president Park Geun-hye were being investigated throughout 2016 and 2017, refers to nearly 9,300 artists or groups being unjustly excluded from government subsidies or inspected during Park and Lee Myung-bak administrations. The blacklisted figures included some of the nation’s most well-known artists, directors and actors, including Park Chan-wook, Lee Chang-dong, and Bong Joon-ho.